A momentous day. I’m not talking Confederate flags or Rainbow judgements. Yesterday morning, the England women’s football team beat the Canadians. Not that I had anything invested in the game. Corruption and jingoism are the likely eventual result of the world taking women’s sports seriously. But until that happens, England’s win means they will play Japan in the semi-finals, which has set my daughters soul-searching. Should they support their paternal or maternal team? That’s their decision. 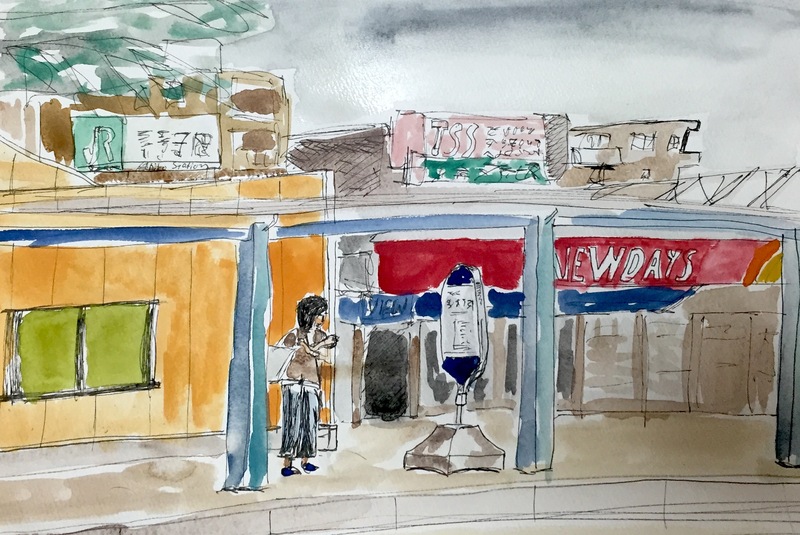 In the meantime, I sketched this outside the Abiko station while waiting to pick up my wife yesterday after her women’s eight-a-side matches in Urayasu. Both of which ended 0-0. A safe result. In other news, I sold nine paperbacks of Children of the Tsunami today at a music event for Link Tohoku, which was a very satisfying result.